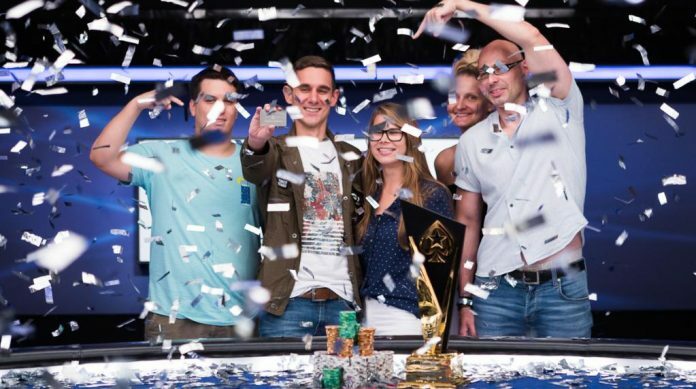 Piotr Nurzynski won the EPT Barcelona Main Event Sunday night for €1,037,109. Piotr Nurzynski just might be the Polish Chris Moneymaker. The 28-year-old former doctor, who qualified for the European Poker Tour Barcelona stop online, won €1,037,109 and a seat in the PokerStars Players Championship next January by outlasting the 1,931-player field on his way to the title. The six-handed final table started with Nursynski sitting in second place behind only Haoxiang Wang. It was Wang who did most of the heavy lifting early on though. It took just over two hours of play before the first elimination of the day. With blinds of 125,000/250,000 (250,000) Matthias Tikerpe moved all in for 3,975,000 from UTG+1 with and Piotr Nurzynski called from the cutoff with . The flop kept Nurzynski ahead and as the dealer dealt the turn and river, Tikerpe was eliminated in sixth place for a career-best live score of €287,050. Ten minutes later, Rodrigo Carmo saw his final table run end. Carmo came into the final table with just 10 big blind and after laddering up one place in payouts, found a spot to get his chips in with a double up in mind. Wang raised to 600,000 from UTG with and action folded to Carmo in the big blind. The Portuguese pro looked down at and moved all in for 4,000,000. Wang called and then watched the board run out to send Carmo out in fifth. That left €180,000 and the $30,000 Platinum Pass to play for. With most of the money set aside though, the action picked up and it took just 30 minutes to send the first player packing. From UTG, Wang raised to 625,000 with before Pedro Marques moved all in for 6,500,000 with . The other two players folded and Wang called to put Marques at risk. The runout couldn’t save Marques from busting in fourth place and propelled Wang to an even bigger lead. Five minutes later Wang continued to be the unstoppable force at the table. Ognyan Dimov shoved for 3,400,000 from the button with and Wang called from the big blind with . Dimov could only watch as the flop, turn and river failed to give him even half the pot and the Bulgarian, who won a WSOP bracelet earlier this summer, was sent packing in third place. At this point, Wang held 78% of the chips in play and seemed assured of the victory. Nurzynski had other ideas though. After doubling up early on during heads up, Nurzysnki then took the lead to set up two hours of play that saw each player holding the lead. Eventually, Nurzynski finished Wang off and turned his €250 online satellite into a dream seven-figure score. With blinds of 250,000/500,000 (500,000), Nurzynski called from the button holding and Wang check his option with . The flop was and Wang bet 500,000 and Nurzynski called. The turne was the and this time Wang checked. Nurzynski bet 2,000,000 and Wang called. The river was the and Wang checked gain. Nurzynski moved all in and Wang, who was out of time banks, called just as the clock was winding down only to find he had the losing hand. Both players ended with €1M scores thanks to the chop. Both players also wound up winning Platninum Passes worth $30,000. Nurzysnki won his for being the last online qualifier remaining in the field. The winner of the tournament was also supposed to get a Platinum Pass, which comes with the $25,000 buy-in to the PokerStars Players Championship and $5,000 for travel and accommodations, but players are only allowed to win one so Wang ended up winning the pass that Nurzynski would have won had he not been an online qualifier.